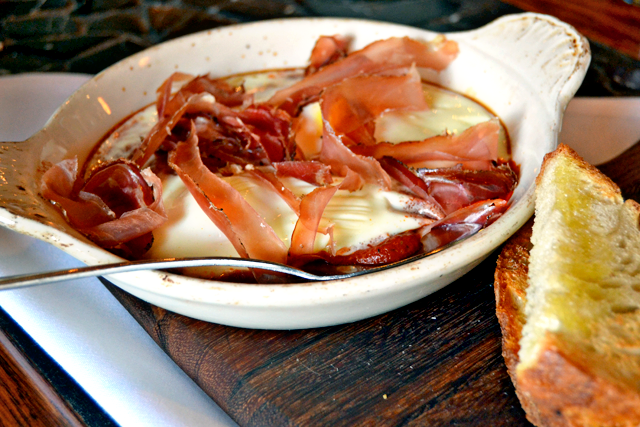 We would be lying if we said Frasca in Roscoe Village was our first choice. What actually happened was, we cabbed and bused it up to endgrain a while back (we’re a bit behind in more ways than one), only to find out it had been shuttered. We’ll never know the magic that is a bloody mary with a cheesy biscuit garnish. Maybe one day Red Lobster will create its own? But Frasca’s brunch and bloody aren’t second best by any means. This wine and pizza bar brings its Italian genius to brunch. 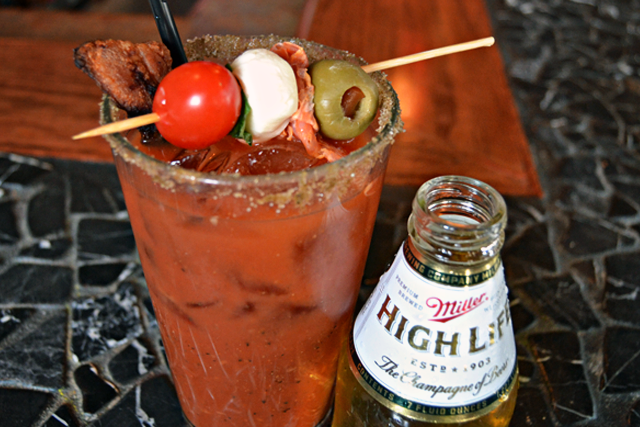 Do you love the bloody at Dunlay’s on Clark or Dunlay’s on the Square? How about Smoke Daddy? Chances are, you’ll love this one, too. The 4 Star Restaurant Group owns these joints and uses Smoke Daddy’s tasty Smokin Mary Mix for all their bloodies. The result? A well-balanced spicy bloody mary that never lets you down (just don’t order it with cucumber vodka. Trust us). Each restaurant’s bloody varies by garnish. At Frasca, you get a deconstructed caprese salad with cherry tomato, basil, mozzarella ball, plus prosciutto and olive. Add a piece of bacon for one buck extra, if you dare. Pizza for breakfast? OK! 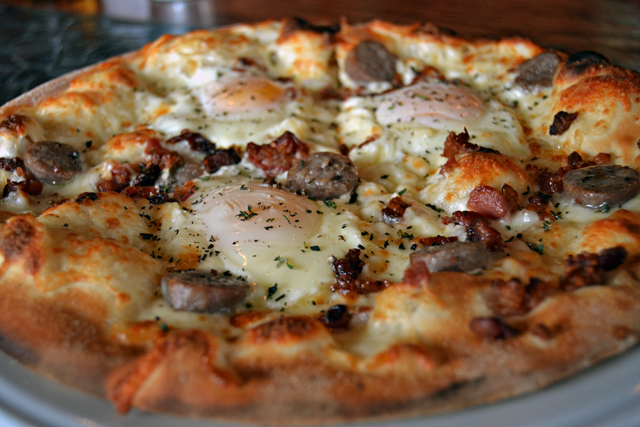 The Breakfast Pizza comes topped with bacon, sausage, cheese and three eggs over easy. Savory and rich, and the crust is perfectly chewy yet crisp. We also had the Italian Farmhouse Breakfast, which is two eggs baked in a crock with speck and tomato sauce which is lapped up and eaten on crusty bread. Why is it that tomato sauce makes everything better? While we weren’t planning to dine at Frasca, we certainly we’re disappointed. Solid bloody mary. Humble Italian food at its best. Definitely gonna have to try this place, that pizza looks yummmmmm. Oh you should try LAVA Bloody Mary mix too ’cause it’s sooo good. Perfect spiciness too imho and love that they use non-gmo tomatoes. I finally got my cravings satisfied lol 😀 http://www.lavabmm.com.